The Cabinet approved a 1.1 trillion won (US$972 million) in-kind investment for a state agency in charge of reclaimed land in the southwestern coastal area of Saemangeum in order to help facilitate infrastructure construction in the area, Seoul's finance ministry said Monday. 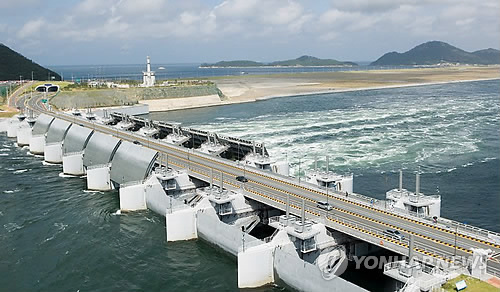 The Moon Jae-in government has been advocating the development of the Saemangeum area, 280 kilometers south of Seoul, pledging a set of support measures such as an expanded budget for infrastructure construction. Last month, the government launched the Saemanguem Development Corp. to move the reclaiming work there forward. To spur development in the area, the government has vowed to expand the state budget for building major roads linking it to other regions and to support the region's efforts to host the 2023 World Scout Jamboree. The Saemangeum area in North Jeolla Province spans 40,200 hectares and is home to the world's longest seawall, which measures 33.9 kilometers. The seawall was completed in 2010 to attract businesses in a variety of fields, including agriculture and renewable energy.